New Caledonian Champions! Thanks to McGrath! 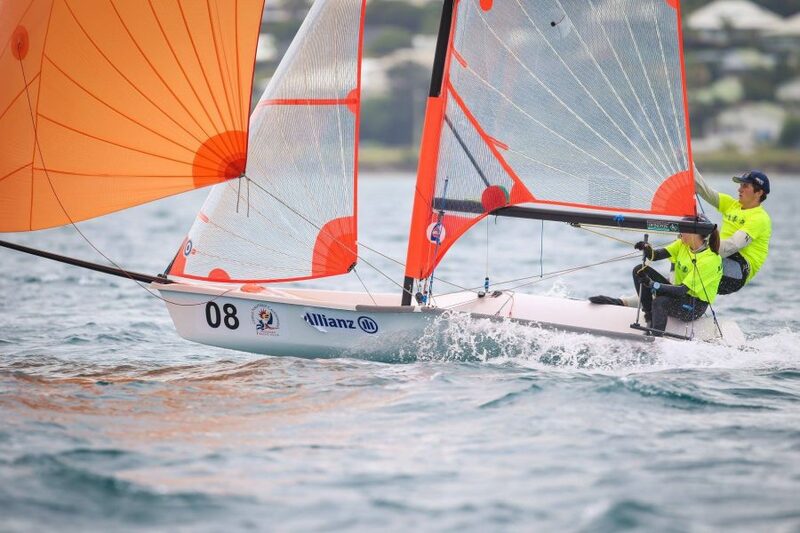 RQYouthSquad sailors Ashlee Daunt and Tom Needham (member of the Queensland Academy of Sport) have won all but two races to secure the event after a range of conditions in Noumea. Thanks to the support of Bayside Cleveland – McGrath for their support of the 29er class at the Squadron and this fantastic opportunity. In 2nd place in the regatta were fellow squadron members Luke Rogers and Matt Rogers, they held off the local teams and challenged Ash and Tom through the event. In the New Caledonian Optimist Championship, Squadron member Angus Wheatley finished 2nd Overall! To have our sailors on the podium in both championships is an excellent result in events which included a strong showing from New Zealand as well as the local competition. After success at Queensland Youth Week in July this year, I was privileged to be awarded with the opportunity to travel to Noumea, New Caledonia for the Allianz New Caledonia 29er National Championships. With me, along for the journey was my crew, Tom Needham, Matt and Luke Rogers, and our coach for the trip, QAS performance coach Ash Brunning. On Tuesday 16th October, after much anticipation, we embarked on our journey to Noumea. This was to be my first international flight, so not going to lie, I was a little nervous. After a long day of travelling we touched down safely in New Caledonia on Tuesday night, and it was as though we had travelled a long-haul flight straight to France. Arriving late to the opening ceremony (because of flight delays), we were warmly welcomed by all our new French friends and host club CNC. Eager to get sailing on the clear, blue waters of Noumea, we got straight into training on Wednesday morning. This was my first experience sailing somewhere outside of Australia and, safe to say, it was a pretty good first experience. The waters were pristine, flat and most importantly warm, making our training in a perfect breeze of 10-12 knots all the more enjoyable. Unlike our training day, New Caledonia threw almost every direction of breeze our way throughout the regatta. For the first three days of the regatta, we experienced fairly light and extremely shifty breezes. This challenged us greatly especially considering we were competing against boats with a great deal more local knowledge. Regardless, both Australian teams persevered, and we came away with some great results on the first three days, both securing a place in the top four going into the final day of the regatta. Knowing this, we continued into the final day confident, but with the same mentality used to approach the previous days of the regatta – it is anyone’s race to win. The breeze on the final day was up from the previous days, providing us with a great 10-14 knots. These were perfect skiff racing conditions, flat water and nice breeze, we were keen. For Tom and I, this was our most successful day, both in results and in actual racing processes. After three days of the regatta we finally sorted out our starts and improved significantly on our communication. Despite some malfunction with their boom gooseneck, the Rogers’ boys also pulled away with some great results on the final day to solidify their position in second. Overall, I have learnt so many lessons from this regatta and regardless of what the results show, there is still so much improvement to be made. I can’t speak on behalf of the others, but I know everyone who went on this trip has taken something away from it. If it weren’t for the support received from Stephen Everett and his team at Bayside McGrath, and RQYS, we would not have had this amazing opportunity. Thank you dearly for all for your support, this is an experience I will remember forever.